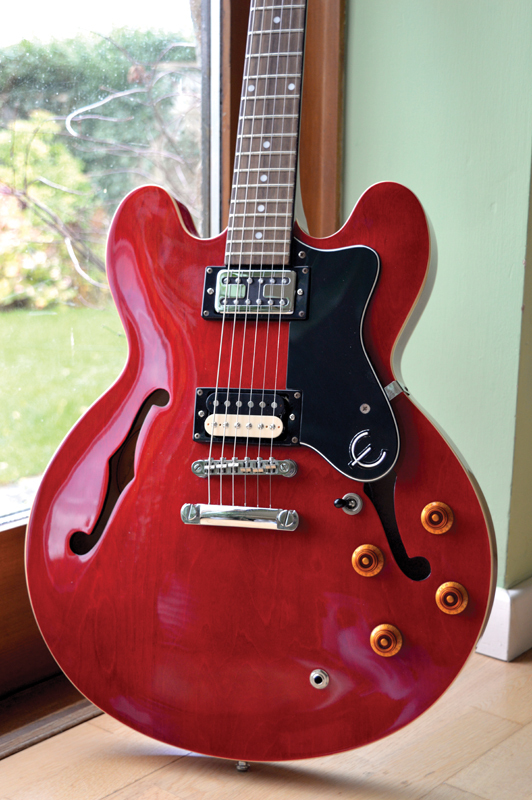 Tom Turner’s well-used Epiphone Dot was starting to show its age, so he decided a new set of pickups and an upgraded wiring harness were the way to go. Not long after I had first started playing guitar, I took the semi-solid I was playing at the time to a local luthier to ask him how much it would cost to replace the dodgy output socket. “It won’t cost you a thing,” he replied. When I asked why, he answered, “because I’m not bloody doing it”. He told me rewiring a semi-solid electric was one of the most difficult and fiddly of all guitar repairs and something he hated doing. So I decided to do it myself and two weeks later, when I had finally managed to reassemble my guitar, I had to concede he had a point. 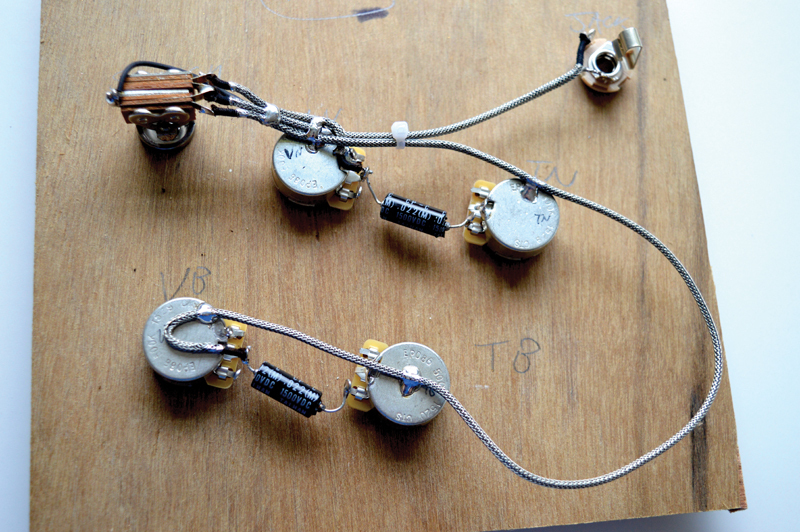 Since then, I’ve rewired a fair few ES-style guitars. It’s still not a process I find particularly easy or enjoyable, but at least it doesn’t take me two weeks anymore. 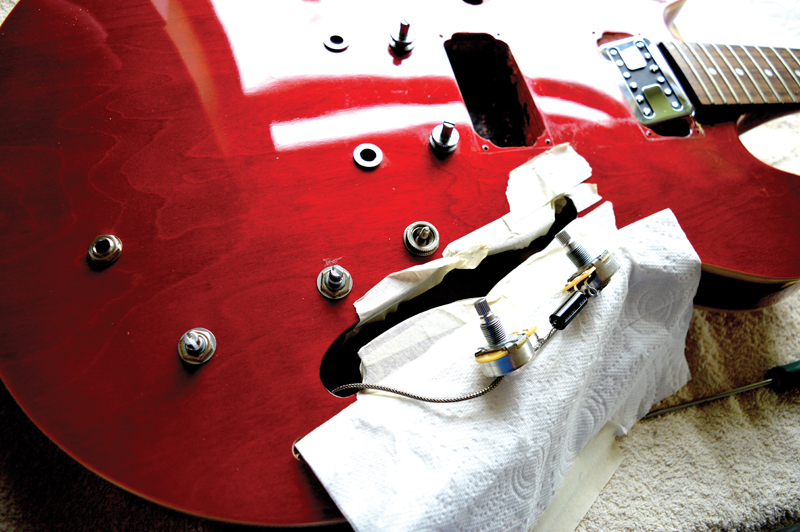 Working on solidbody electrics is so much easier than semis, but there always comes a time when the urge to upgrade becomes irresistible – or unavoidable if the controls get so bad the guitar can’t be used. Both scenarios applied to Tom’s guitar. He wanted new pickups installed to improve the sound, but the control potentiometers and switch had seen better days. When the time for keyhole guitar surgery on a semi comes around, it seems sensible to do the whole lot while you’re in there. Tom decided on a set of Creamery humbuckers – a Custom ’59 in the bridge and a Baby ’71 in the neck. In addition, Tom asked me to install new CTS 500K audio taper potentiometers, replace the jack socket, upgrade the tone capacitors and wire them 50s-style to the volume controls. Although they look like electrolytics, the ones I used are actually vintage-style paper oil types called Black Bees. We decided to retain the switch. Tom fancied a set of vintage-style tuners to improve the looks and make the headstock lighter. Creamery pickups can be bought directly from the manufacturer (www.creamery-pickups.co.uk), and all the other parts we used are available from Allparts UK. 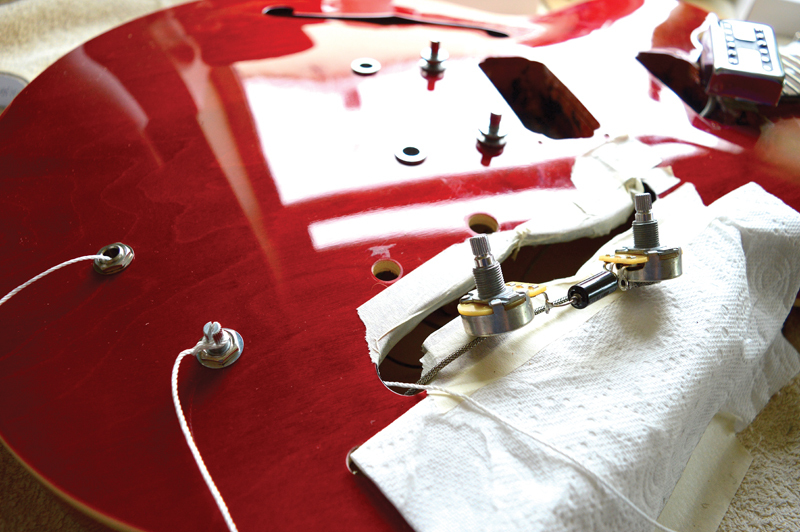 Begin by removing the strings, tailpiece and bridge, along with the tuners and scratchplate. 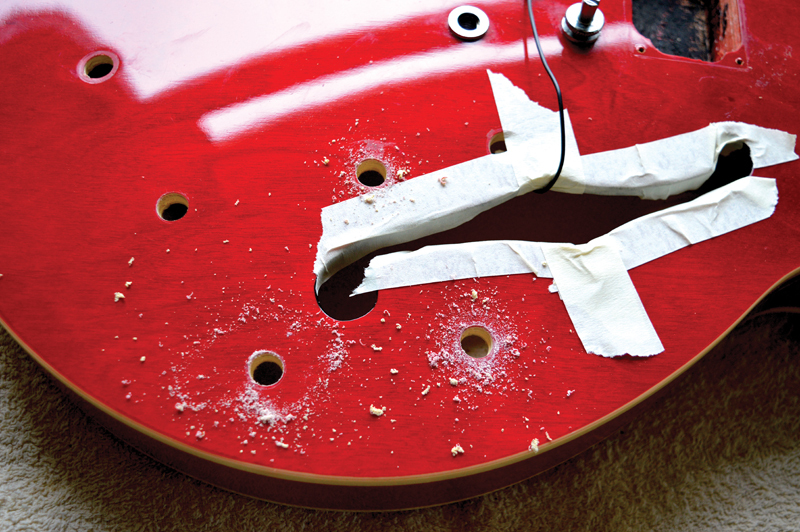 It helps to have a container on hand when you’re stripping down a guitar – as each part comes off, it goes straight in the container. Being diligent is the best way to avoid losing parts. Here, I should distinguish between semi-solids, of the ES-335 variety, and semi-acoustics, of the ES-330/Casino variety. The former have a solid block running through the centre of the body, but the latter are completely hollow. With the fully hollow ones, you can often pull the wiring through the bridge pickup hole. Tom’s Epiphone is a semi-solid, so the only option is to pull the wiring out through the treble-side F-hole. But before you start on a project such as this, try to look inside and locate the ground wire. The ground wire was originally soldered to the casing of the bridge volume pot. It’s important to keep the ground wire safe and remember to reconnect it to a ground point on the new wiring harness. With tune-o-matic-style bridges and tailpieces, the ground wire will probably lead off from the bridge area and may be soldered to the casing of one of the potentiometers. When the pickups have metal braided wires, the earth wire is sometimes wrapped around the pickup wires and soldered in place. If the guitar has a Bigsby or trapeze tailpiece, the ground wire may pass through a hole in the tail block and be soldered or pressed against the tailpiece. Either way, the ground wire is important and must be reconnected later. Before pulling everything apart, I pressed masking tape against the edges of the F-holes so the tape protected the finish from any sharp edges on the metal parts. You should surround the F-hole area with a protective covering. I use kitchen paper folded double and held in place with masking tape. The nuts and washers were removed from the four potentiometers and the jack socket. Three-way toggle switches of this sort are held in position by a round nut, and getting them off using pliers risks scratching the top. Investing in the correct tool is money well spent, and I bought mine from Allparts UK. All the parts were pushed down into the body and one by one they were pulled through the F-hole. Here’s the original wiring harness after it had been extracted through the F-hole. Once the pickup wires and ground wire are disconnected, it can be removed completely. 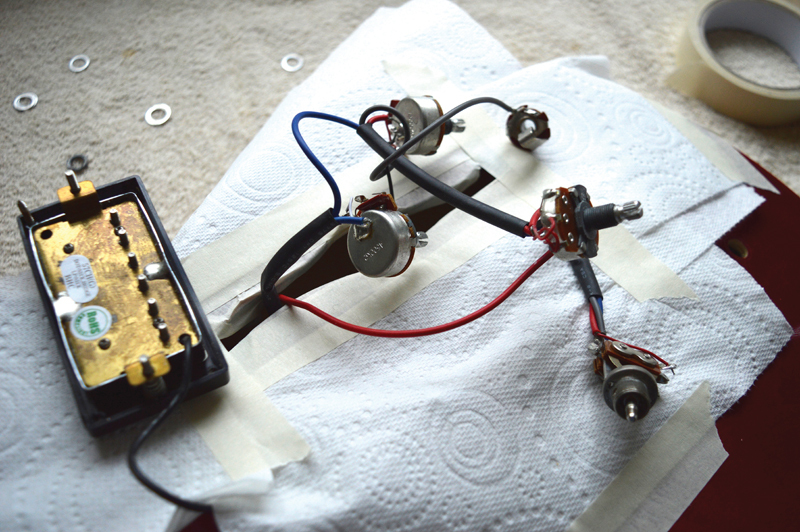 Once the volume potentiometers were out of the guitar, I de-soldered the pickup wires and the ground wire. The pickup connections were snipped and the wiring was then removed from the guitar. All the wiring for the new pots, switch and jack socket has to be done outside the guitar body. It’s vital that you get the spacing of the parts correct, so the easiest method is to make a hookup board. 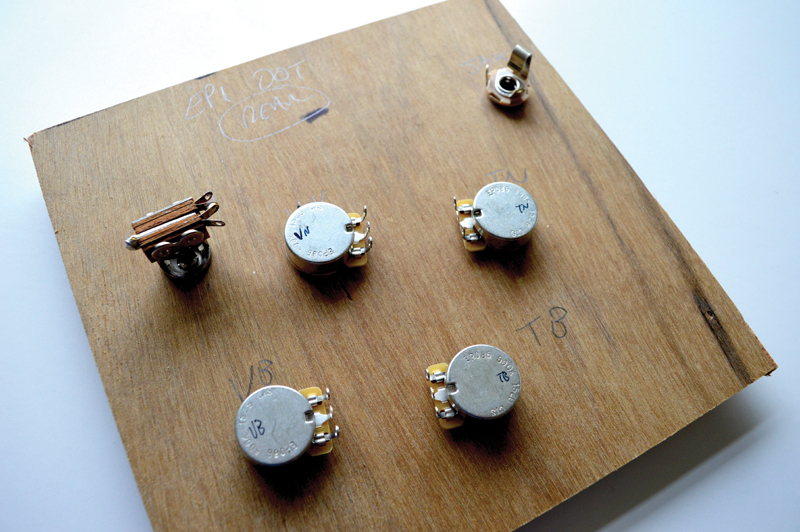 Components can be mounted on the board in exactly the right positions while the soldering is being done. 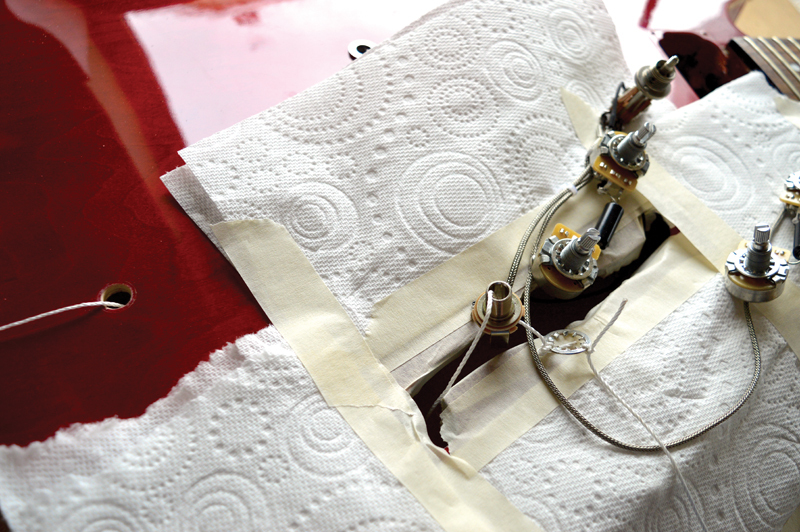 It’s also wise to ensure that hot soldering irons spend as little time as possible in close proximity to the lacquer. I placed a sheet of white A4 paper over all the holes then pressed down with my fingers to create impressions of the holes on the paper. Placing a sheet of paper over the holes and pressing each hole with your finger will mark the position of the holes onto the paper. 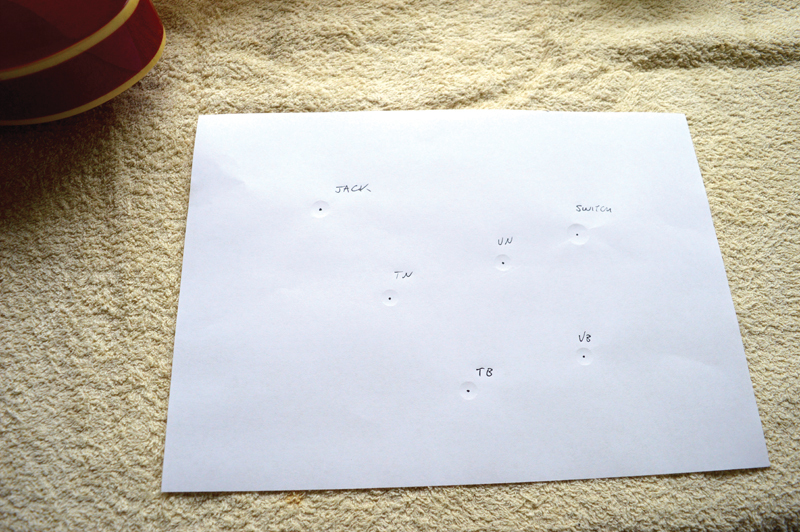 Then mark the centre of each hole with a pen. After marking out the centre point of each hole with a black pen, I held the paper over a scrap piece of 5mm plywood and carefully tapped a nail through each pen mark to transfer the hole positions onto the wood. With a 3/8-inch bit, I drilled out the potentiometer and jack holes, and a step cutter was then used for the switch hole. Holes for the hardware were drilled out to the required sizes and then labelled front and rear. Before mounting all the parts on the hookup board, don’t forget to remove the locater tags from the potentiometers. Guitars manufactured in the Far East generally have components made to metric dimensions, but in the US everything is still imperial. The upshot was that the holes all needed to be enlarged in order for the CTS potentiometers and the Switchcraft jack socket we got from Allparts UK to fit. Simply having a go at the existing holes with a 3/8-inch (or 10mm) drill bit could end in tears because there is a danger you will chip the finish around the holes. I prefer to use a step cutter bit, and after marking the stop point on the bit with masking tape I carefully widen the hole with the drill running at a fairly slow speed. Using a step cutter is a safer option and it’s the best way to make really wide holes. Here, you can see masking tape being used to mark the stop point. The edges of the hole will taper and the potentiometer shafts may not push all the way through. 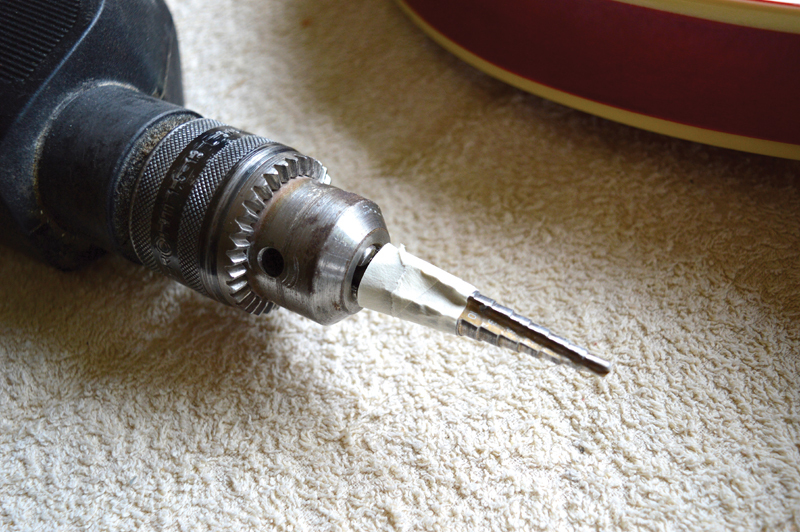 To finish off, attach a regular 3/8-inch (10mm) drill bit and drill out the bottom of the hole. To avoid chip out on the underside, take care not to push down with the drill. Here are the holes in the process of being widened. Note how the black ground wire is taped to the top of the body to stop it from falling back inside. All the components were mounted on the hookup board and positioned for easy connections. The jack socket, switch and all the potentiometers are mounted onto the hookup board. Here are the components viewed from the rear of the board. Note how the solder tags of the potentiometers face each other. It makes sense to label the board and the potentiometers themselves so you know which is which. Everything is reversed because you are working from the back rather than the front. Download a wiring diagram, but take care if you’re re-using the switch. The Far Eastern switch may have different connection tags to US ones. I started out by bending the grounding tags on the potentiometers to touch the casings and soldered them together. Next, I connected the capacitors between the volume and tone pots. 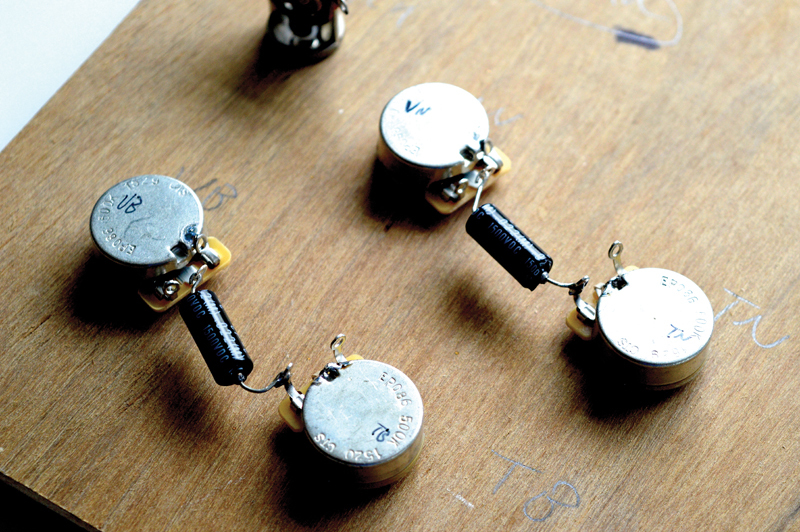 Start the soldering by making the four ground connections on the potentiometers and positioning the tone capacitors. 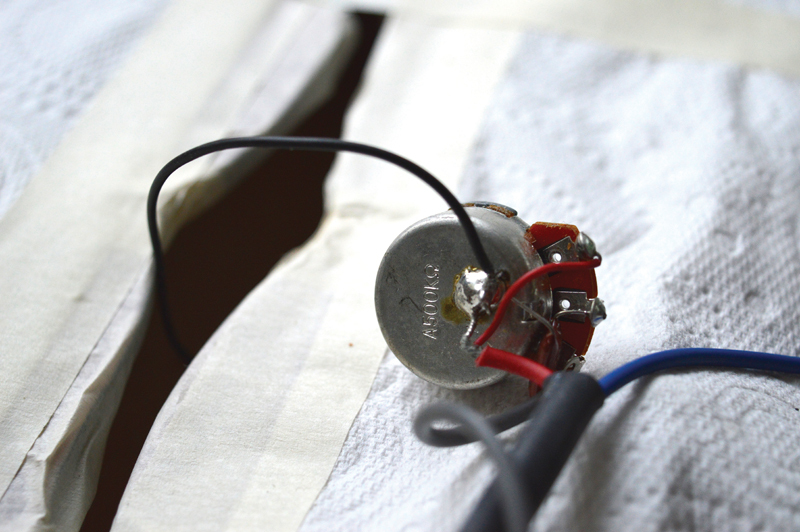 The Black Bee paper/oil capacitors are only soldered to the tone pots. 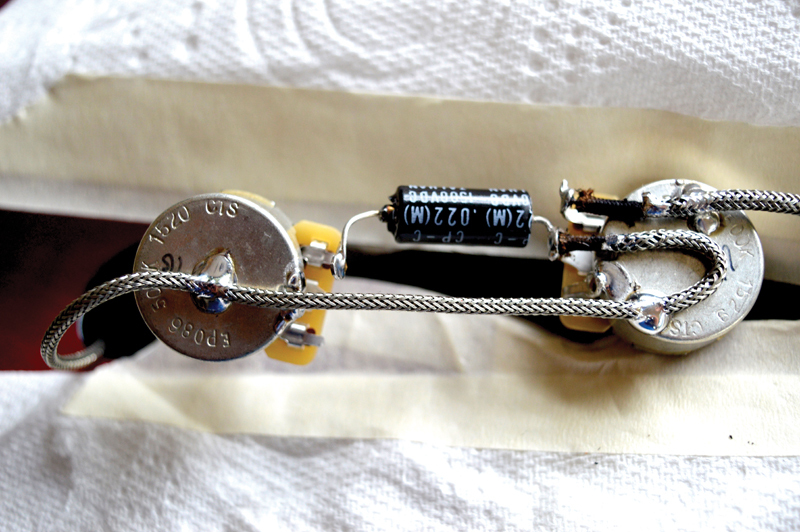 The capacitors are connected to the centre tags of the volume controls, which is the way Gibson used to do it in the old days. I also left the leadout wires very slightly longer than they needed to be to allow some wiggle room in case the potentiometer shafts didn’t quite line up with the holes. The hardest part of the hookup is soldering the braided wire to the pot casings. To do this, you really need a powerful soldering iron, and I set mine to its maximum – 450 degrees. Follow the diagram carefully and feel free to use cable ties to hold things in position while you’re soldering. The wiring harness is complete. Note the long loop between the two tone pots on the right of the picture and the extra length of the capacitor leadout wires. Both help to make the installation easier. Adjacent to the switch, a length of bare wire was wrapped around all three braided cables and soldered. Some heat shrink was slipped over the leadout and the other end was soldered to the switch ground lug. 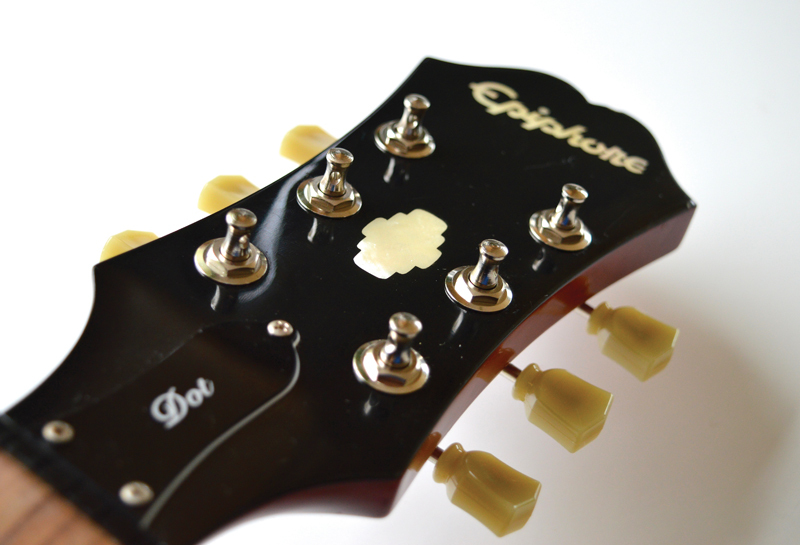 The Epiphone switch had a ground lug on the left. A ground wire was wrapped around all three braided wires to the right of the switch and soldered onto the braids and the switch itself. I also allowed a longer than usual loop of wire between the two tone controls. My plan was to install the jack, both neck pickup controls and the switch while both bridge pickup controls remained outside the body. I had tried the ‘all at once’ approach before and I figured this would be easier. After checking all the connections by eye and testing them for continuity using a multimeter, I was pretty confident everything would work. At last, it was time to put everything back inside the guitar. Some people adopt the ‘ship in a bottle’ method and pass strings through each hole in the body. These are tied to the components then the strings are pulled to draw the pots, jack and switches through the holes. Rubber tubing is sometimes used, too. This might sound easy, but in my experience the strings tend to become tangled or fall off. Instead, I used the string method only for the jack socket and the neck tone control. All the other parts are so close to the F-hole that you can use your fingers to position them. I pushed a length of solder wire through the jack socket hole and fished it out through the F-hole, tied some string to the solder wire and pulled the string back through the body then out of the jack hole. The string was threaded through the jack socket and tied to a washer. The jack socket and the neck tone potentiometer are about to go inside the body. Note the strings attached to the washer next to the jack socket. One string will be used to pull the socket into the body and the other will be used to pull the washer back out. A second length of string was also tied to the washer. I repeated the solder wire trick through the neck tone control hole and tied the string to the shaft of the tone pot. The new neck pickup was placed in position and I fed its wire through the body and out of the F-hole. The jack socket and tone pot were pushed through the F-hole into the body, but I left the neck volume pot and switch outside. 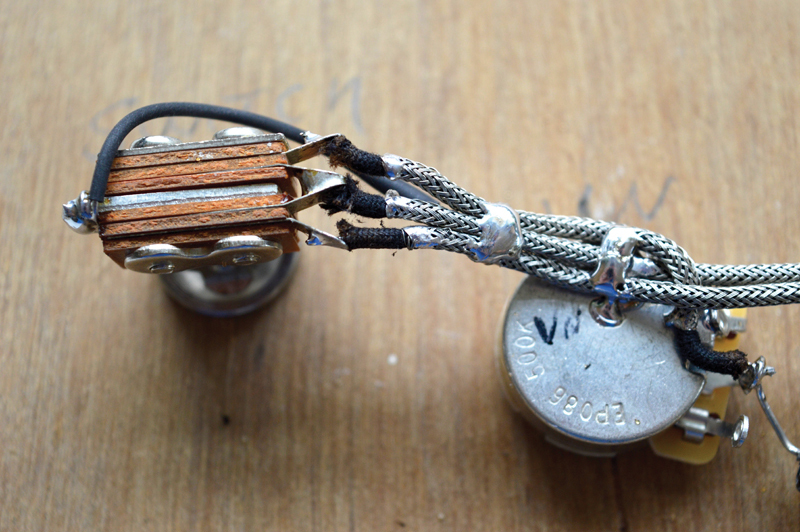 The ground wire was wrapped around the braided wire and soldered before I soldered the pickup wire to the volume pot. 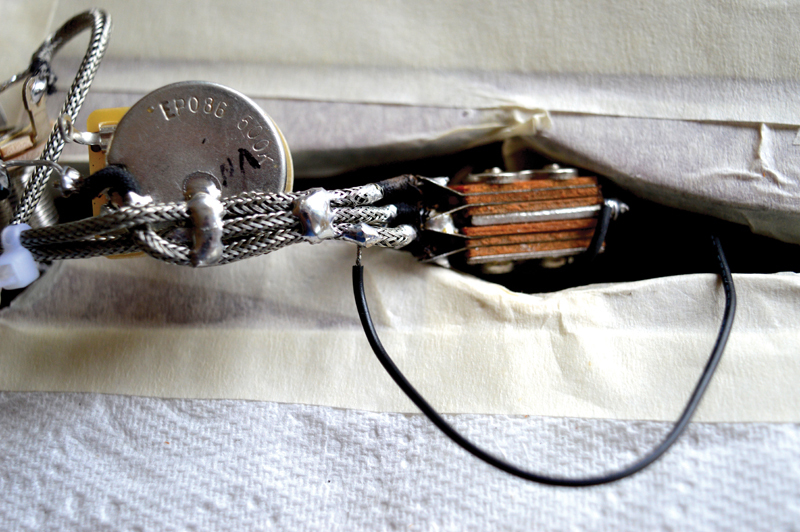 The ground wire is wrapped around the braided wires next to the switch just before the neck pickup is connected to its volume pot and the volume pot and switch are inserted through the F-hole. 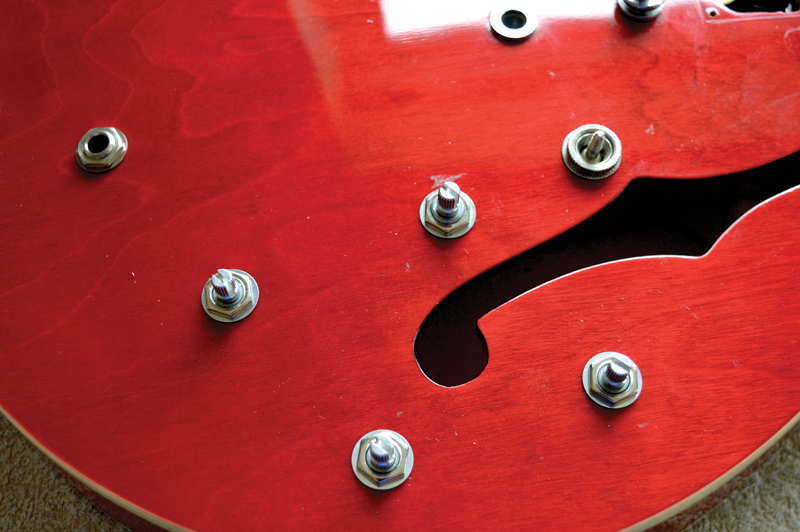 After allowing everything to cool down, the neck volume pot and switch were passed into the body via the F-hole. 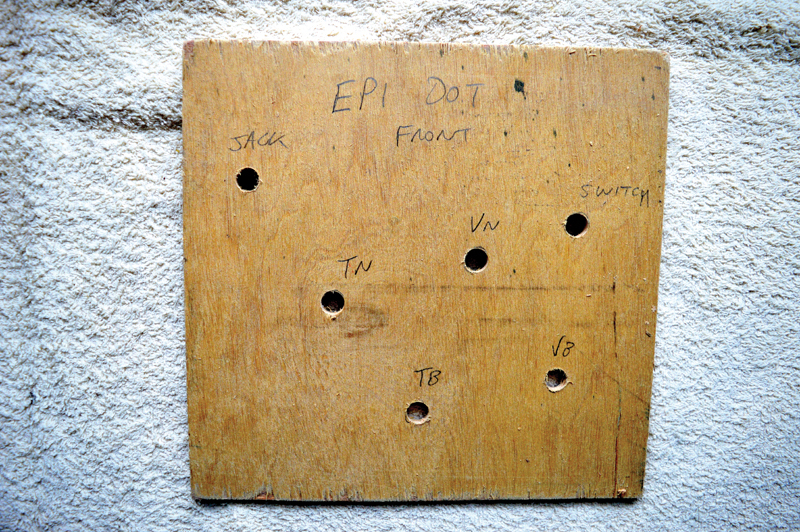 The jack and tone control were pulled into position and loosely held in place with their washers and nuts. The jack socket and neck tone controls are in position and the nuts and washers are holding them in place but the strings are still in position. The neck volume pot and switch are about to be guided up into their holes. You can usually push the volume control and switch through their holes using your fingers, but a thin screwdriver and long nose pliers can help, too. Once installed, they were also held in place by washers and bolts. At this halfway point, the bridge volume and tone controls were still outside the body. The neck volume pot and switch are not fixed in position but the bridge pickup control pots remain outside the body thanks to that long wire loop. The hookup process was repeated for the bridge pickup and both controls were then pushed inside and secured. The wire from the bridge pickup is soldered onto the volume pot and the controls are finally ready to go inside the body. When you are inserting the potentiometers, don’t forget the knurled washers that will prevent them from spinning around. Everything’s in. Don’t forget to test it’s all working before you tighten everything up and restring. I plugged in the guitar to test everything was working before tightening things up. Compared to the rewiring, the tuner swap was effortless. The original kidney Grovers were removed by taking out the screws at the back of the headstock and using a socket wrench to undo the bushings. 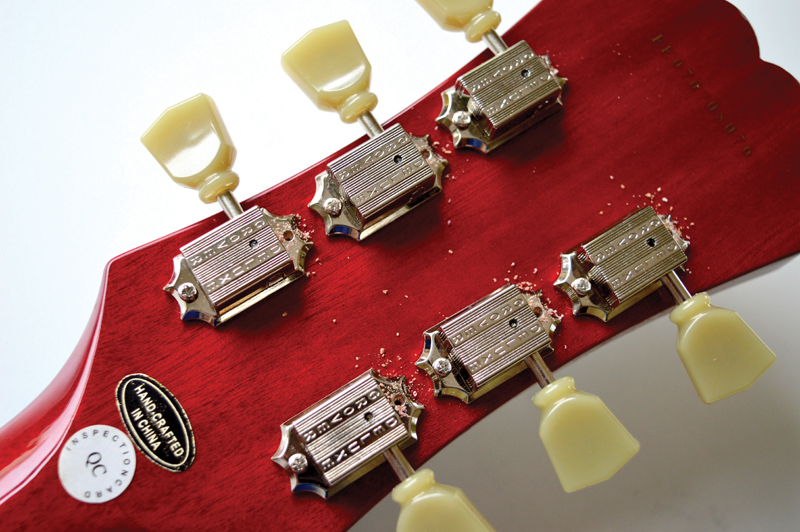 Usually, vintage-style tuners require conversion bushes when they’re being installed in place of die casts, but the Grovers Tom specified are vintage in looks only. They’re actually 14:1 ratio die casts and they were direct replacements for the originals. Even the bottom screw holes more or less lined up. I re-used the original screw holes and tightened the new bushings from the front. The tuners are clamped in position with this bushing arrangement. 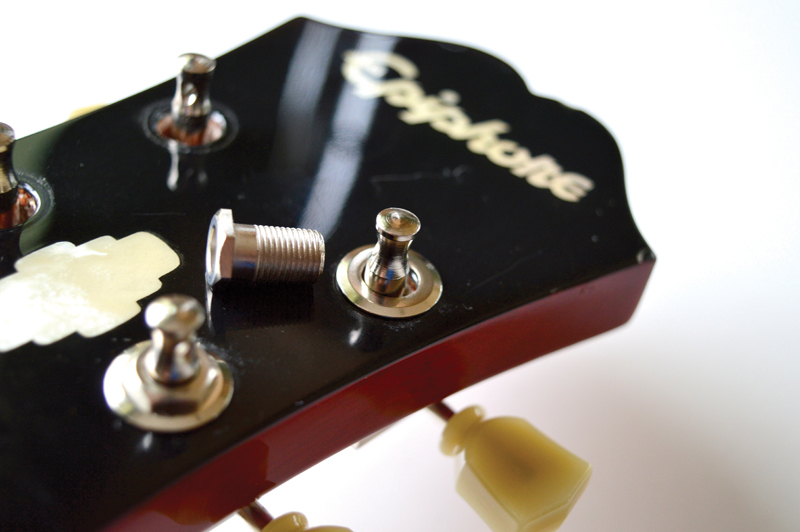 Using the correct-sized socket is the best way to avoid scratching the metal plating and damaging your headstock. After drilling pilot holes, the upper screws for the new tuners were put in place and the job was complete. 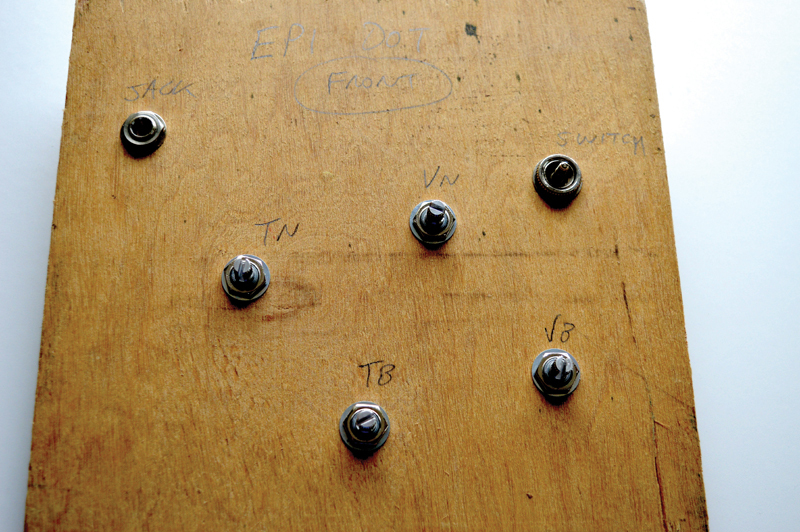 The bottom screw holes lined up with the original tuner screw holes, but pilot holes had to be drilled for the extra screws at the top. The new tuners look better and function more smoothly than the originals. However, you could opt to use only the bottom screw holes if there’s a possibility you might want to revert to the original tuners at some point. I can say from experience that installing a new wiring harness is easier than trying to re-install an old one. I feel this job went smoothly because I was able to restrict the number of pull strings to two so nothing got tangled up. Leaving a slightly longer than usual cable loop between the tone pots allowed me to install the controls in stages rather than all at once. As it turned out, this rewire and pickup installation was relatively straightforward. The key is to be methodical and remain calm when things get fiddly. The new pickups represent a significant upgrade on the stock items – clarity is retained when you turn the volume controls down, and the tone controls have a nice gradual response. I like the tuners a lot, too. The guitar seems to have a much better balance than it did before and they feel more precise. All things considered, I think this Epiphone Dot project was well worth the effort, and hopefully Tom will too.